For those new to Hind Commander I’ve previously posted a quick synopsis on the game. The battlefield was fairly unremarkable, a few ridges and small stands of trees surrounding a large town that was just on the Russian side of the front line to the north. A small helicopter detachment from the USMC had been sent to clear the town of all Russian forces present. Unaware, the Russians had set a trap: a hoard of Russian helicopters was waiting with the sole intent of destroying as much of the opposing helo force. Things started well for the USMC: their AWACS support quickly revealed a nest of T-72s and BMP-2s surrounding the objective and two Vipers, with a Kiowa in support, moved in to start lighting up targets and launching hellfires. 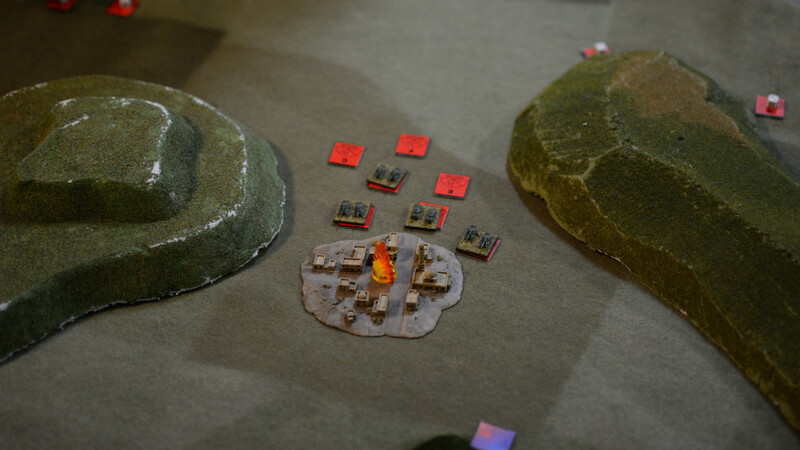 The first 3 turns saw 3 Soviet vehicles destroyed, one damaged and another 3 with scraped paint. Meanwhile the Russian Hinds had been moving around ridges surrounding the town: keeping low to avoid the US helos controlling the centre. 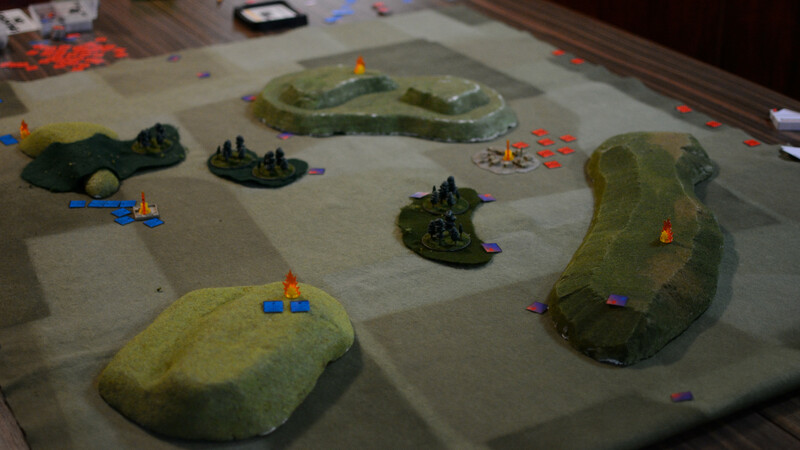 The first significant contact occurred on the western edge, here a lone Hind and Viper met. Early AAM fire from the Viper was ineffective and so the two helos closed to get within rocket and cannon range. On the east side of the board 2 Vipers and 4 Hinds met and started to close. Again early AAM fire was ineffective. 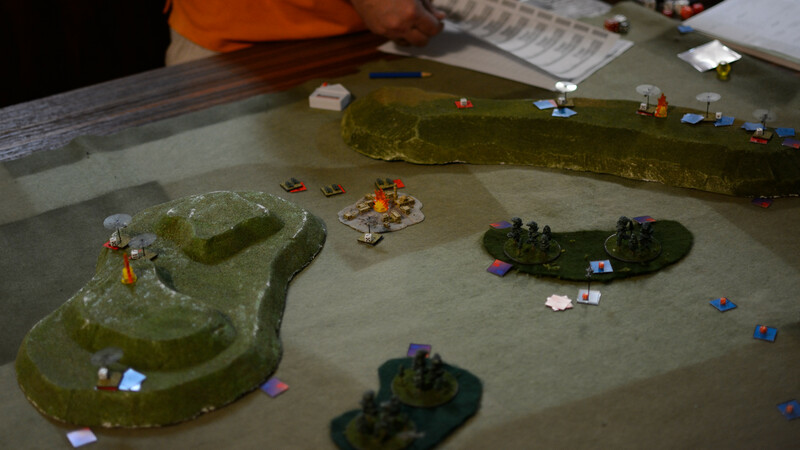 Realising they were outnumbered the USMC helos began to dodge and weave to break the Russian tracking, while using the AWACS to do the tracking. By this stage the Kiowa had come within sensor range and called in an F/A-18 to strike two Hinds that were threatening it and the pair of Vipers. It was the last thing it did, however. The Hinds had popped up over the ridge line and it was torn apart by rockets. The eastern flank was not going so well. The isolated Viper made fairly quick work of the Hind, but it was too late. As it fired its salvo another Hind from long range got a lucky rocket strike and downed it in a single shot. By the time it had finished the western flank had collapsed. The F/A-18 misplaced it’s run and was only able to destroy one helo, another Hind was brought down in the action. However another Viper was also downed. As it was late we called the game. 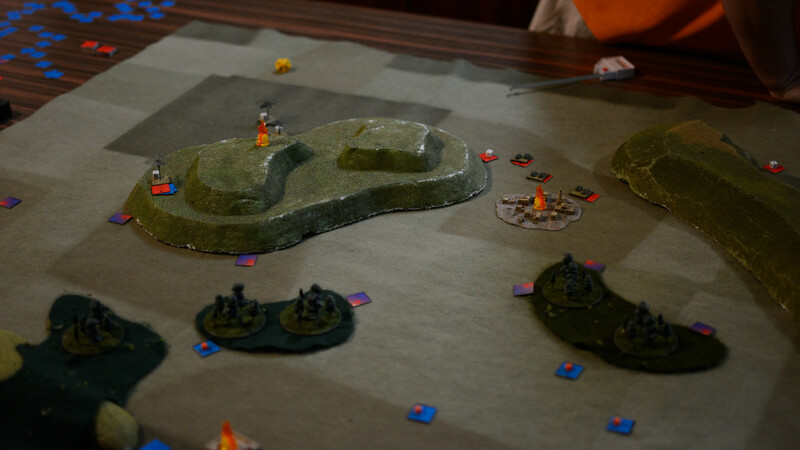 The Russians had destroyed 3 out of 6 helos leaving only 1 Viper and 2 Venoms to face 5 Hinds. 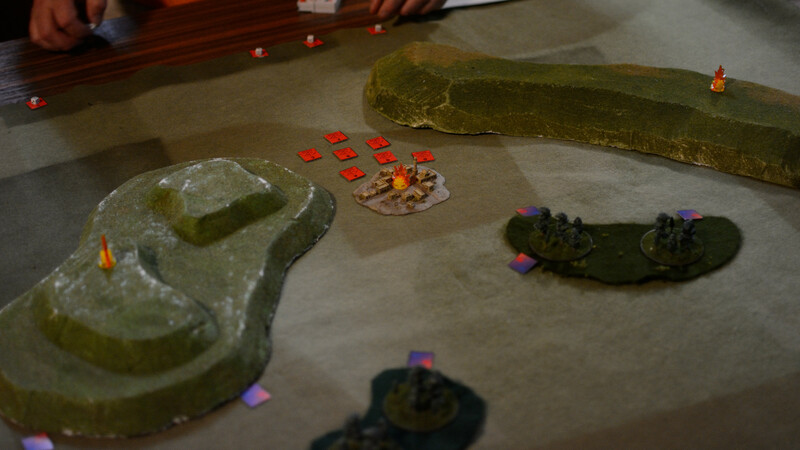 The Russians met their victory conditions, but had gone beyond their acceptable loss amount. The USMC had failed on both accounts: too many casualties and they the objective wasn’t cleared. The final score was 2-0: a tactical victory for the Soviets. 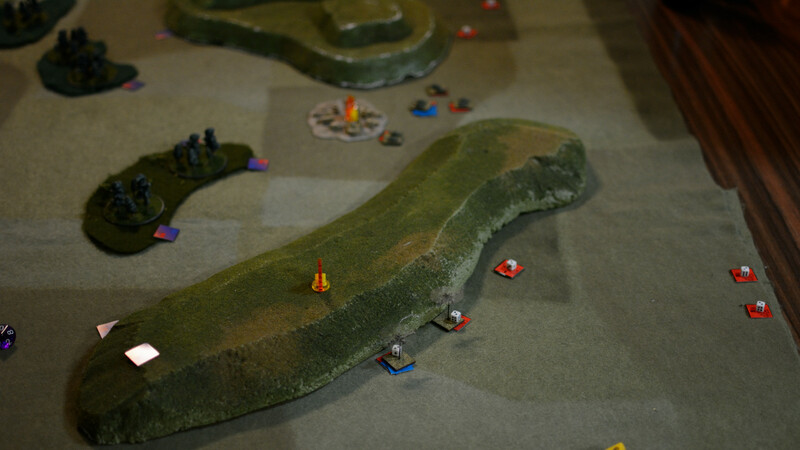 The battlefield at the start of turn 1. The red counters are the Soviets. 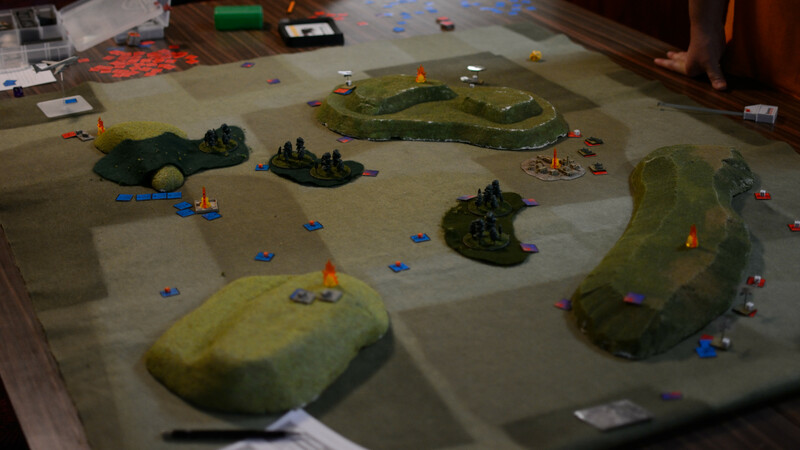 The key features are the town (surrounded by the red counters that are Soviet vehicles) and the two ridges on the town’s flanks. A close-up of the town: 7 vehicles and god knows how many infantry would have to be cleared for mission success. Starting to identify the vehicles around the town. Turns out they were all T-55s and BMP-1s (my opponent had miss-read the ground forces design rules and only included fighting vehicles and no transports. Soviet helos hiding behind the ridge while merry hell was raised on the vehicles in the town. The other flank – note the drop in the number of vehicles. The early turns were not kind to the Soviet ground forces. 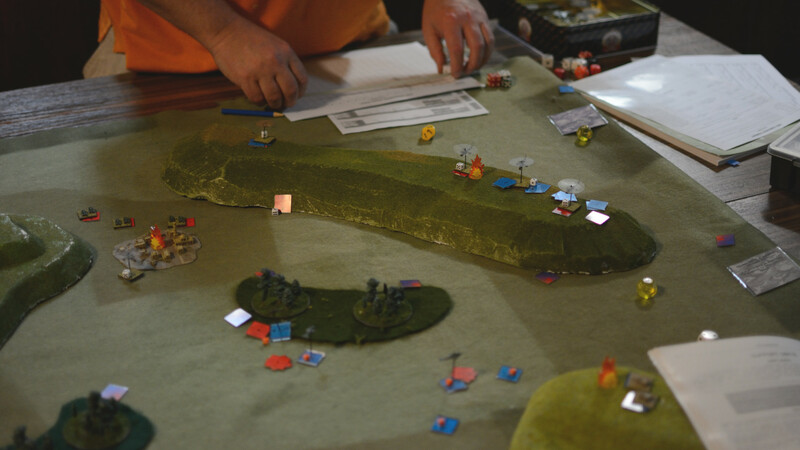 An overview of the battlefield about mid-game. The town’s slowly being cleared by AGMs, but the USMC general has foolishly split his limited helo forces into two parts. 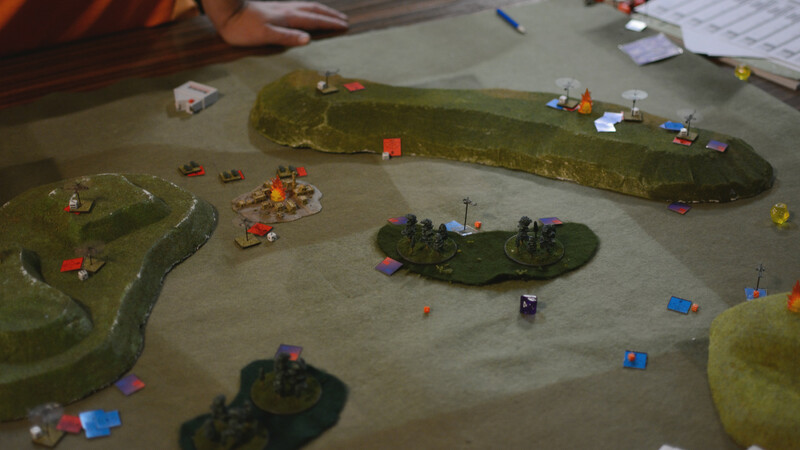 More damage in town (BTW we’re using the explosions to represent strategic objectives). More Soviets arriving – too many of them. Very close to the end here, the town never lost any more than this. 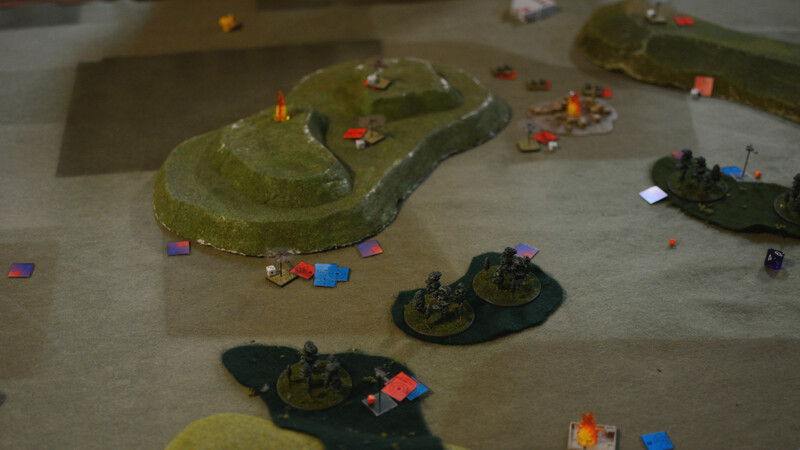 A couple of Soviets are dead and so are a couple of USMC by this point. Thanks for the report- liked it a lot. It seems like my kind of game so I’ll look out for a copy next time I’m at a gaming show.